Programmable thermostat / wall-mounted / for heating - TPZ1/TPZ2 - JUWENT - SZYMANSKI - NOWAKOWSKI - JANIK SP. J. Electricity, Smart buildings, Access control > Building automation, Software > Programmable thermostat > JUWENT - SZYMANSKI - NOWAKOWSKI - JANIK SP. J.
TPZ1/TPZ2 JUWENT - SZYMANSKI - NOWAKOWSKI - JANIK SP. J.
TPZ1/TPZ2 Thermostat is recommended for use in the heating and ventilating units with fresh air circulation to protect the heating coil from freezing. 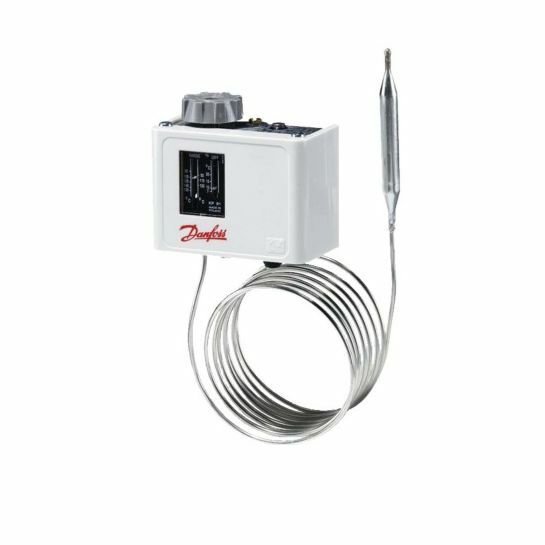 The thermostat is equipped with a capillary tube arranged along the heating coil area. If the temperature drops below preset limit (5OC), the thermostat sends a signal to the Power Supply/Control Box which, in turn, outputs „HEATER ALARM” message, switches on the fan, closes the open air circulation damper and fully opens the heating water valve of the heating coil. The system returns to the normal operating mode automatically after the temperature of the heating coil has increased. In the system with TP(PP) Indoor Thermostat, the TPZ1 Freezing Protection Thermostat is used and the TPZ2 Freezing Protection Thermostat is installed in the system with RT Temperature Controller.